The healthcare industry is transforming at a rate faster than ever before. To address the speed of this transformation, healthcare providers are faced with balancing the implementation of cutting-edge technologies and forward-thinking processes with the financial impact of each decision. While continuous improvement is an absolute necessity, integrating and maintaining transformative concepts can be a challenging task without a methodology that allows and encourages “out-of-the-box” thinking in a safe environment. When innovative leaders in healthcare delivery and design work side by side, healthcare can be reimagined, setting the stage for not only operational, but also institutional cultural shifts needed to address change. The key is integrating a methodology and mindset that facilitates real innovation and does not confuse it with incremental improvement. By helping individuals “unlearn” old models and patterns, pre-existing barriers can be broken to allow room for the creativity required to design medical spaces that offer optimal experiences for patients and their families, as well as staff. Pioneering hospitals are doing this through a focus on understanding today’s user; patients, staff and families who will all be a part of the experience. Those that are successful encourage involvement and buy-in from all stakeholders through a practiced methodology. 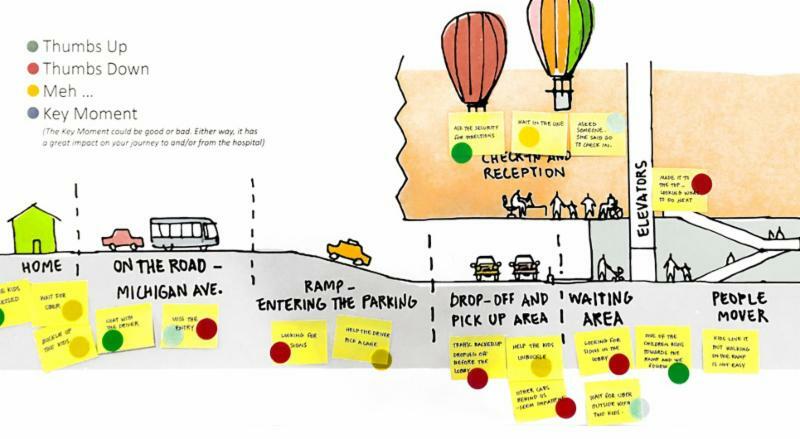 “Design thinking”—the process by which we enable inspirational and innovative thinking and engage clients in overcoming complex problems together—is an emerging methodology for healthcare design that is driving its evolution. It provides a framework for bringing together story-based, ethnographic research with evidence-based design and a rigorous decision-making process to create more meaningful, functional and efficient solutions based on user experiences. This approach can produce a new mindset through the process of co-creating with the client. The end result is customized, yet practical, knowledge, coupled with empathy—all focused on the client’s unique needs—that can shape the future of the human experience in the resultant built environment. The five steps of design thinking methodology allow us to go beyond just design. They can, over time, empower those who are charged with patient care and operations to own the resulting innovations and adopt the changes needed to thrive within them. Building Empathy: This step involves encouraging the process of unlearning—of suspending our assumptions for the sake of inspiration and insight. This begins with empathy. The goal is to ensure designers and decision-makers fully understand those who will be using their facilities. Defining the challenge and opportunity areas: This step requires producing a coherent vision that synthesizes the insights gleaned from the empathy step and developing an actionable problem statement—a true summary of the challenge. Building a prototype: Any idea that results from ideation needs to be tested. Prototyping offers the ability to investigate a variety of possibilities quickly and effectively. Iterating prototypes: Testing is a key step in co-creating with the user. In this iterative mode, designers place their prototypes into the appropriate context of the user’s life. If empathy is listening to people, testing the prototype is listening to the product. For more insight on Design Thinking, read the complete article in the May/June 2018 issue of Medical Construction & Design.